( we do not reccomend to cover the inner sole with it ). A little note: although our wax is 100 % natural, it is not suitable to eat. It is not long-lived either as it contains no preservatives. Do not put it in the fridge because it will solidify there. Also, do not leave it in the sun – if you do, it will spill out of the box. IPPOMARE sandals are made of natural leather and natural leather does not like water. We suggest that you do not wear the sandals during rain and we advise you not entering the sea, rivers or pools when you have these sandals on. However, if the sandals get wet through, we reccomend a natural method of drying: leave the sandals at ambient temperature, with access to fresh air. Do not dry the sandals with the help of dryers, bonfires or even radiators. The sandals do not like to be heated – the leather may shrink or deform, as a result. 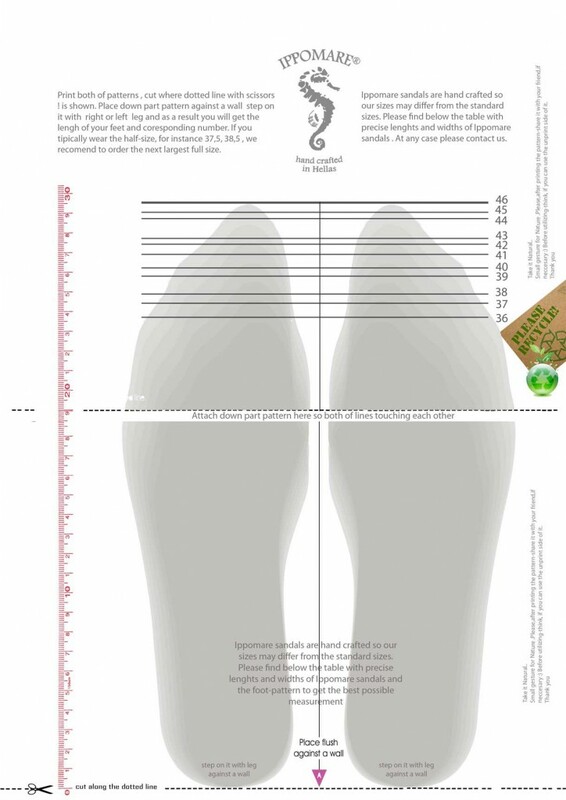 Print the pattern with the foot, stand on it with your right leg and as a result you will get the lengh of your feet and coresponding number.If you tipically wear the half-size, for instance 37,5, 38,5 , we recomend to order the next largest full size. If you wear the size, which is not mentioned at the available sizes, please contact with us: contact@ippomare.com. we will do our best to come up to your expectations. Our sandals are hand-crafted by small manufactories located in Greece. We believe that high-quality products need to be waited for a little longer. We use our best efforts to limit delivery time to no longer than 10 working days + time neccessary for contact with nature. (outside the Greece). Particular pairs of sandals may differ in their color shades, as the IPPOMARE sandals are made of genuine leather – dyed or natural, which may come in various shades in itself. The manual method of leather coloring used by us can, also produce slight variations in color. Our sandals are made from the highest quality natural leather and we use our best efforts to make the workmanship of our sandals as good as possible. Also, due to differences in resolutions of computer screens and monitors, shades and colors of the products may be slightly different in reality.